Full tank shot. Very unimpressive but going the right direction. Finally glued down all my corals. Everything in the pic is pissed off from scraping all the Corraline off the glass and moving stuff around. Hard to tell in the pic but Corraline is spreading everywhere. Hopefully today they will all open back up. Also collected a few Corraline scrapings off my frag rack for my buddies 800 gallon office reef. EDIT: today everything is open and happy. Even my cardinal and my goby pistol pair came out for a group photo. 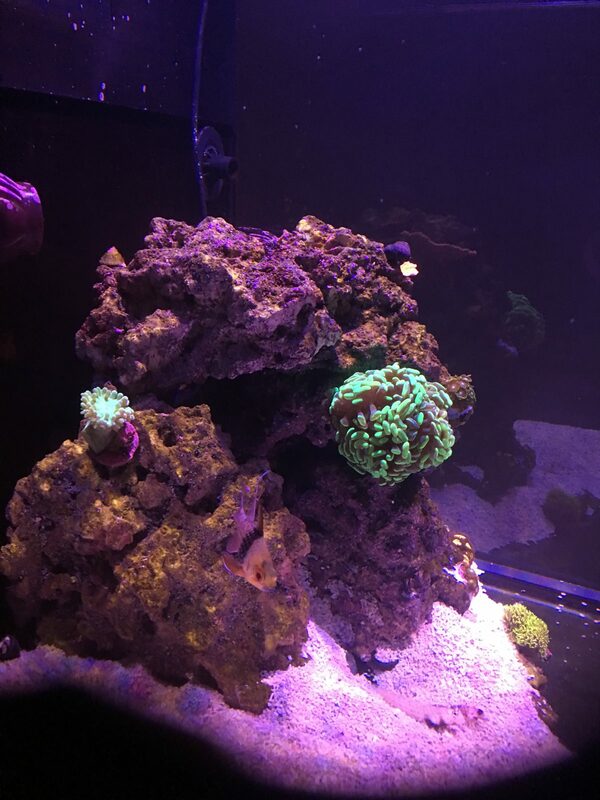 Nano reef clicking along. 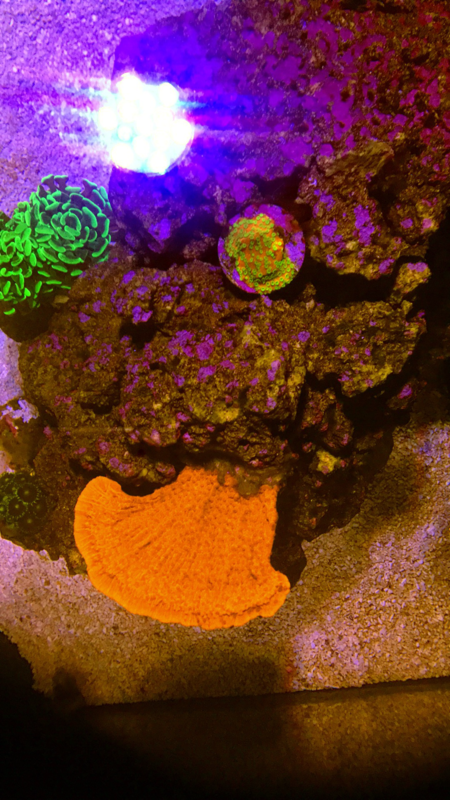 Corals are growing and look healthy. My only issue right now are phosphates creeping up slowly despite continuous daily water changes and that my continuous water change tends to slowly drift my salinity down over the week. I’ve recalibrated my DOS bit it’s still doing it. I suspect it’s due to the way it’s calibrated. You calibrate it in its forward direction but the right pump runs backwards to remove water from the tank. I suspect the error is there. I feel I’ve got two choices. Run a higher salinity on the replacement water or re calibrate Nd have the removal head set to remove a little less than its supposed to by changing the calibration constant. The African tank is cycled. 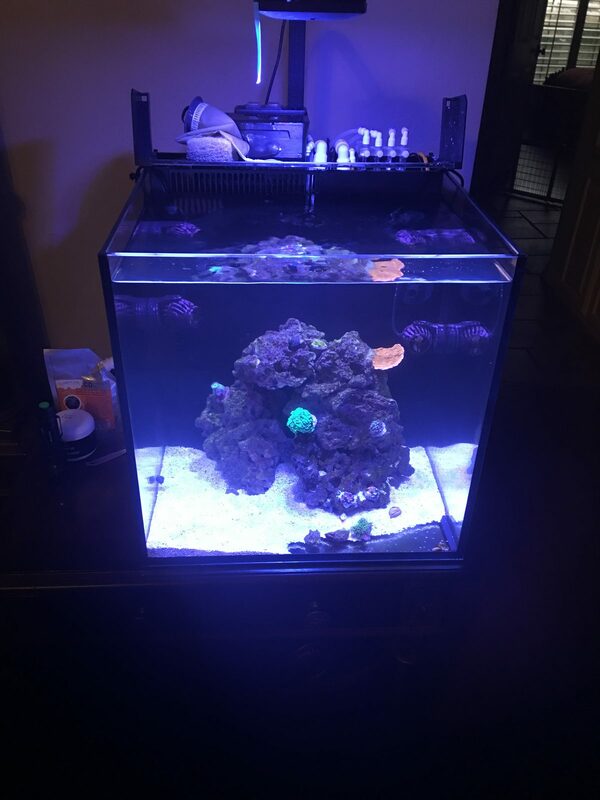 I’m cycling two quaranteen tubs now and Gould be ready for fish in a couple weeks. I found a local importer for my Frontosa. We will order in a group of F0 Frontosa. We will get in some Blue Moba Congo I believe. Should get pics soon. 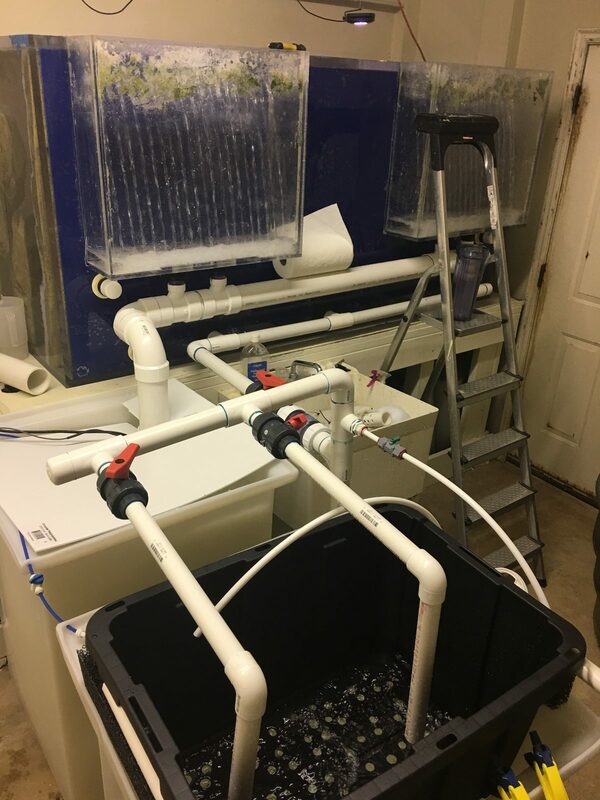 Pics below are my QT tubs and of my final filter layout for the main tank. 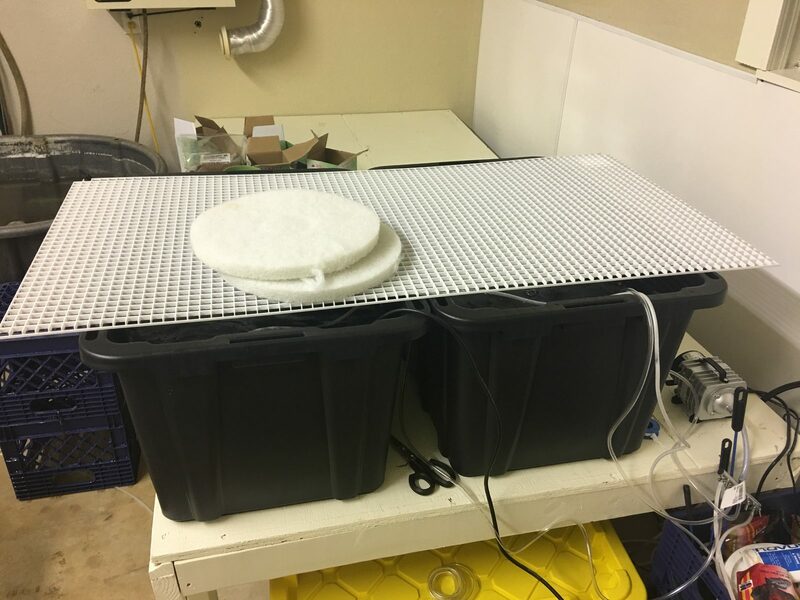 I’ve removed the prefilter stalks for now for the final part of the cycle to make sure it’s processing ammonia independent of what ever might have been growing on the filter pads. Saturday test day and mini water change. Everything looking good with first round of corals. I plan to go get some more frags next week. I did my first gravel vac in a couple months and it was amazingly clean. Maybe too clean? 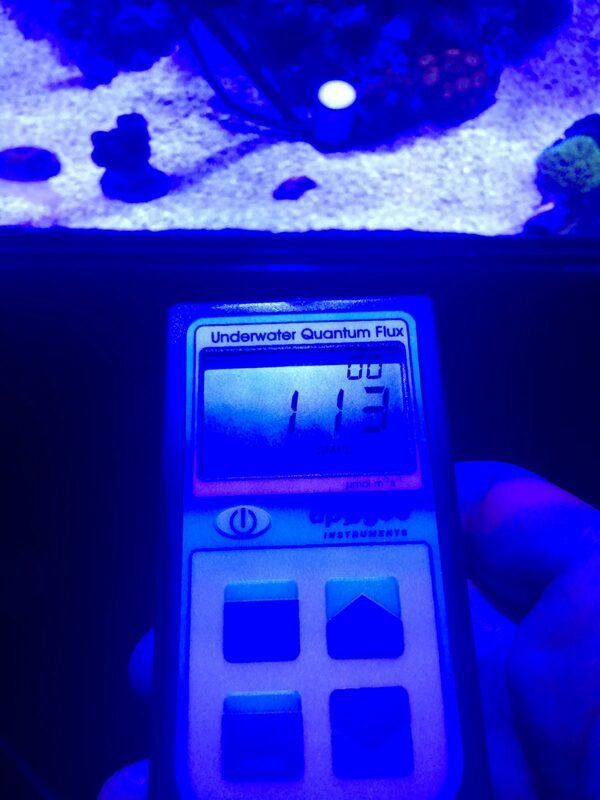 phosphate back down to zero PPB was 27 PPB (0.07ppm) couple weeks back right before I started the auto water change back up. 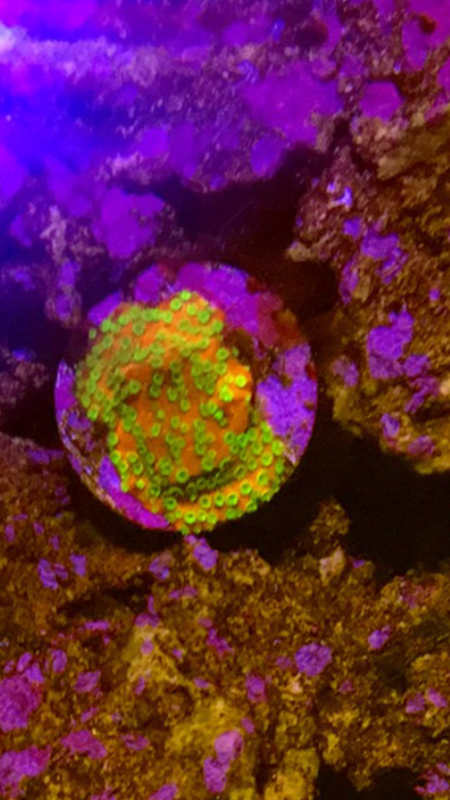 my monti corals are growing and look great. My hammer seems to have doubled in size already. 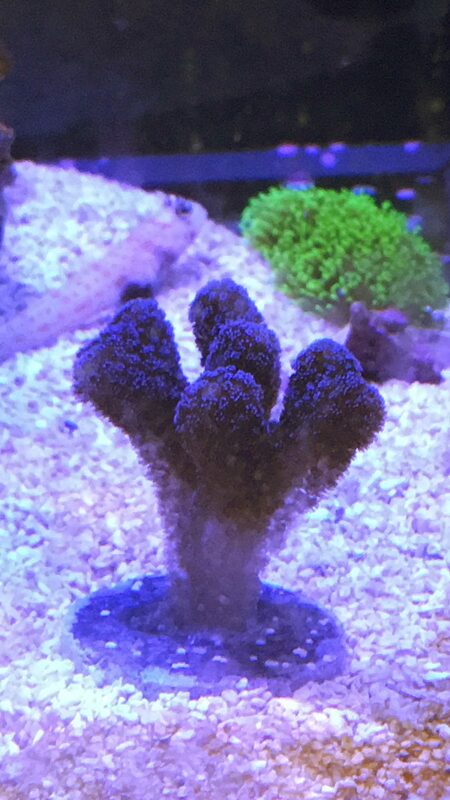 Polyps look great and and hopefully will spread soon. 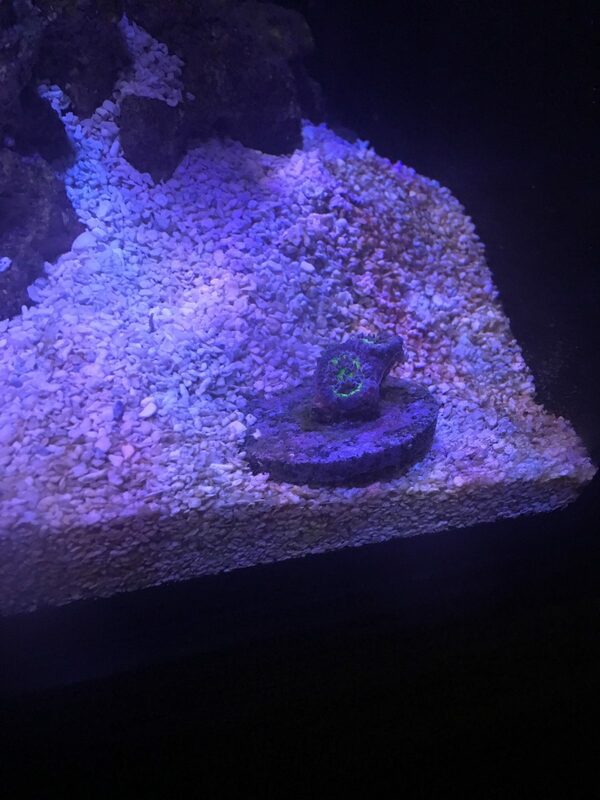 All that purple on top on top of my rock is new growth corraline algae. It’s looking great. I’ve got two colors. One is more dominant than the other. I did put in that corraline in a bottle and dosed both colors. My gut is, these came from that but I’ve also got some that came in on corals and snails too. Nothing special in this NANO yet. 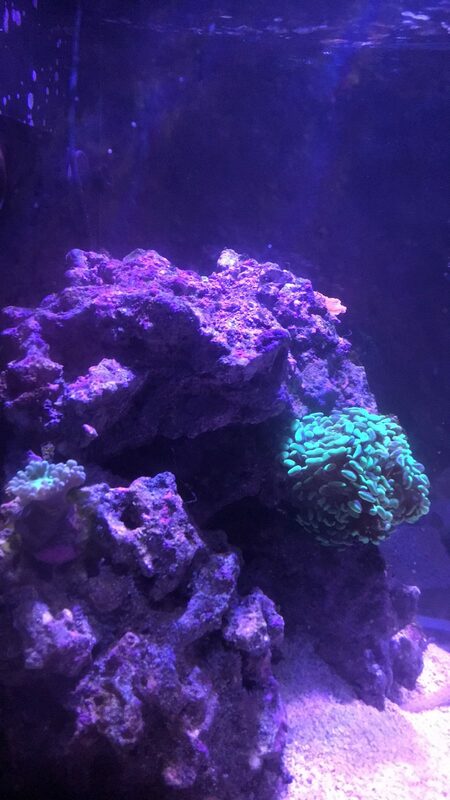 No new corals but hopefully soon. My buddy I was gonna go shop with has the flu so decided to wait on him to get well. 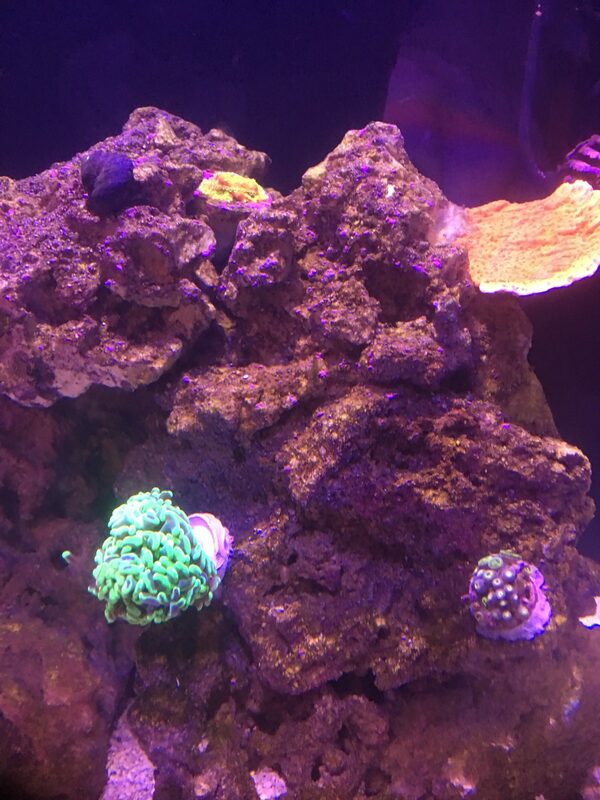 Here is a full tank shot and some one week coral growth pics. Lights have only been on an hour so the LPS are not fully open in these pics. 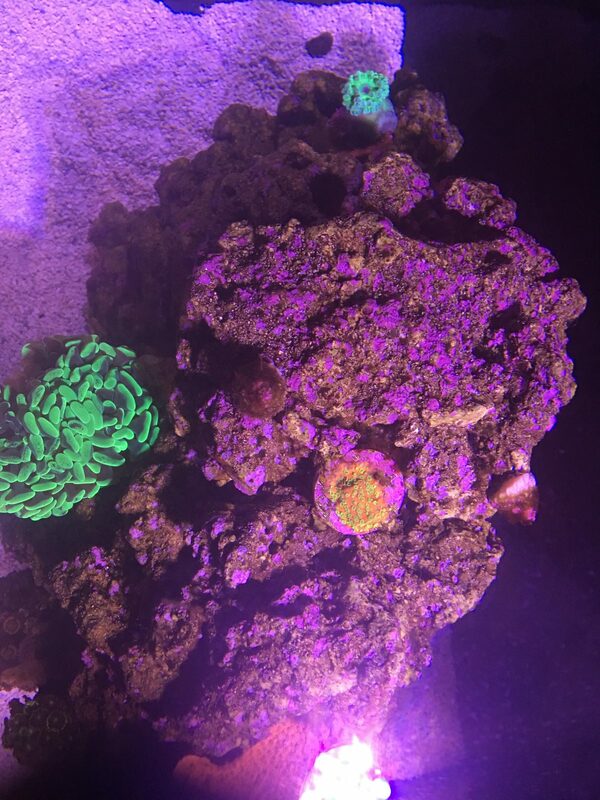 Wow, nice color on the coral in the last pic. Yeah, it’s my current favorite. The green polyps really pop against that salmon colored base. I’m happy it’s growing and about to spread onto my base rock. 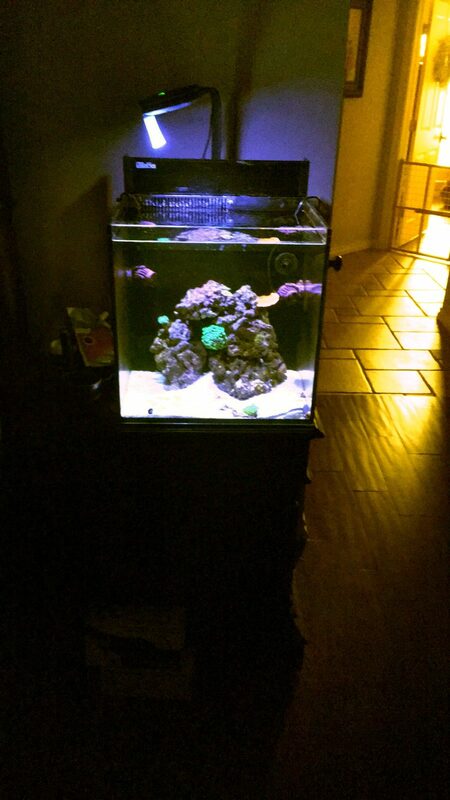 water change was reduced to 750cc per day. African tank testing. 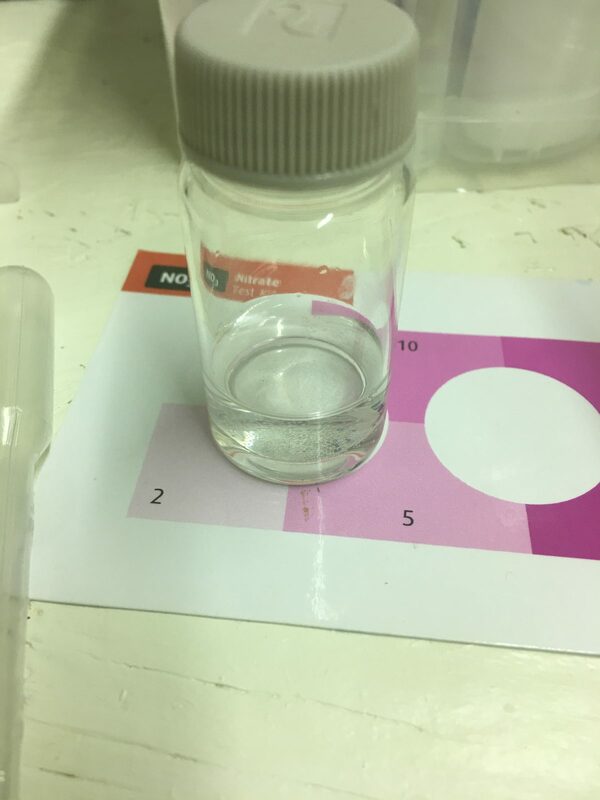 Ammonia dosed 2ppm 30 hours ago. Waiting on QT cycling to order my colony of Frontosa. tank is cycled. I add ammonia couple times a week to feed bacteria and run auto water change to keep Nitrates down. African QT tubs initial cycle. Ammonia dosed about 10 days ago for first time. Dr. Tim’s bacteria added. Added hand full of K1 micro to tubs today to re seed bacteria. See yall all next week. 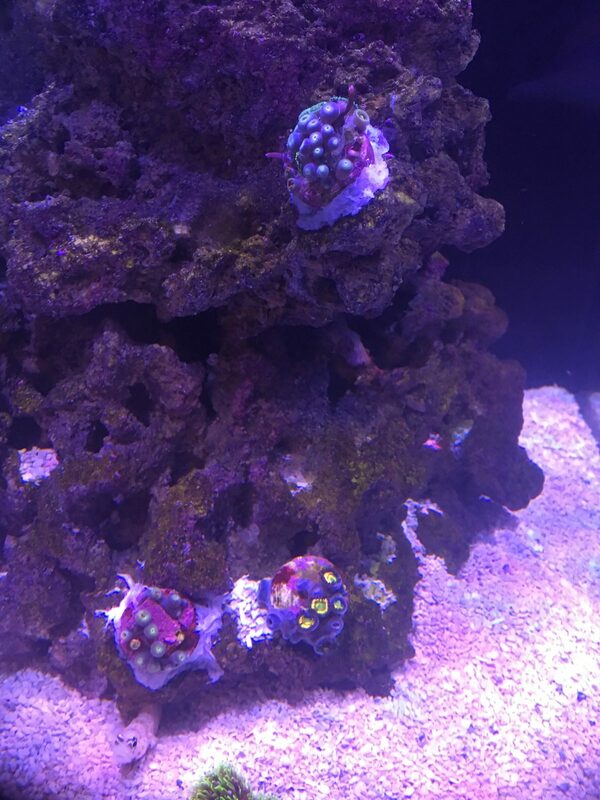 Amazing coralline growth! I am very impressed. Quite a tidy system you've got here; I can tell you run a tight ship. Yeah @billygoat the Corraline really has taken off lately. I started off with totally dry caribsea life rock. Took several months but now it’s growing on everything. My powerheads are covered. 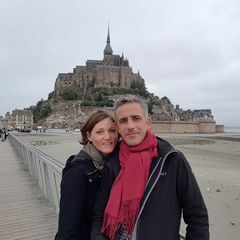 Just a couple update pics. 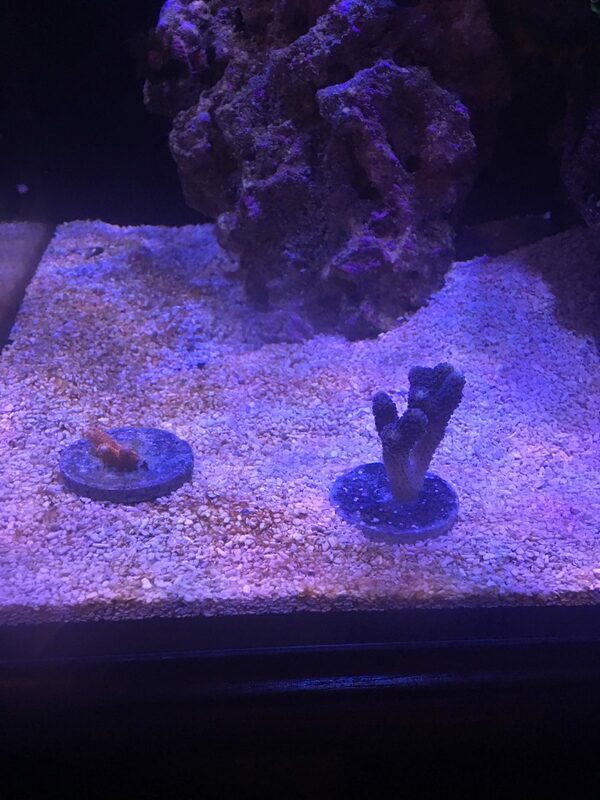 Got a couple new corals. 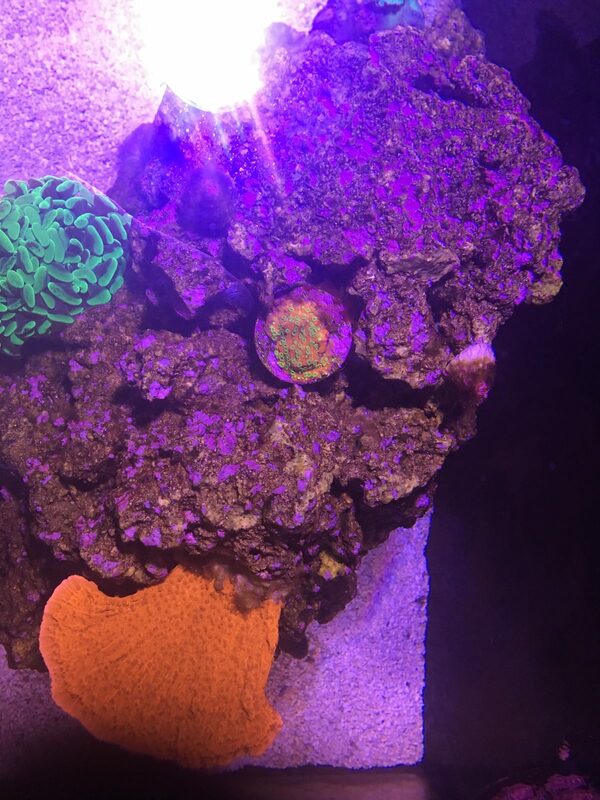 Small green and purple Acan, blue Montipora Dig, and an Orange Montepora dig. They are acclimating on the sand bed. Duncan looking much better with an adjustment to my flow. Corraline growing steady. My Hammer seems to have split into 3 different heads. Borrowed my buddies PAR meter just to get a base line reading. This is with my lights at my max intensity for the day. They only stay this bright off and on during my mid day cycle. Saturday water tests. Nitrates and phosphates have risen to detectable levels finally. 1ppm NO3, 0.07 PPM phosphates. I’ve got some macro algae growing in the display now. Looks to be seeded Chaetomorphia and sea lettuce seeded from my algae reactor. All those white specs on the glass are my pods going crazy. Alk is rock steady at 8.6 getting dosed using two part 3 times a day. Calcium is in the 430 range. 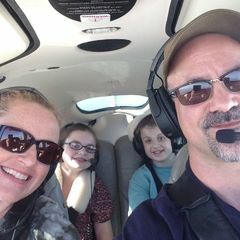 Magnesium is 1400. Temp 78 and salinity is rock steady at 35ppt. 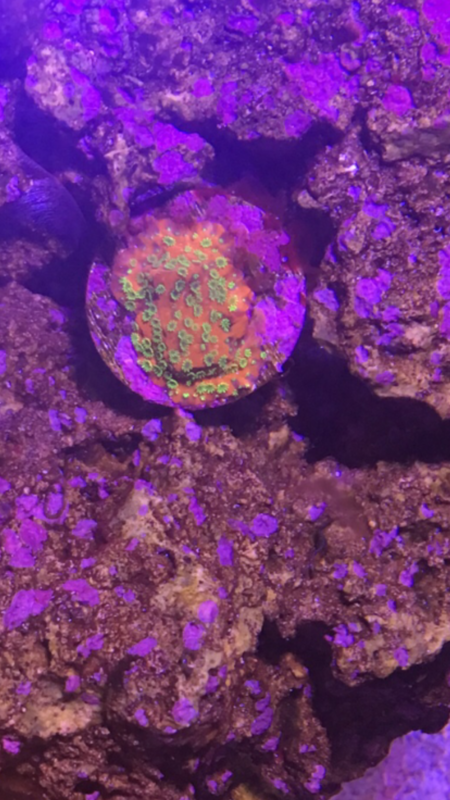 Once I glue these newest corals down I’ll search for few more. Everything looking great. 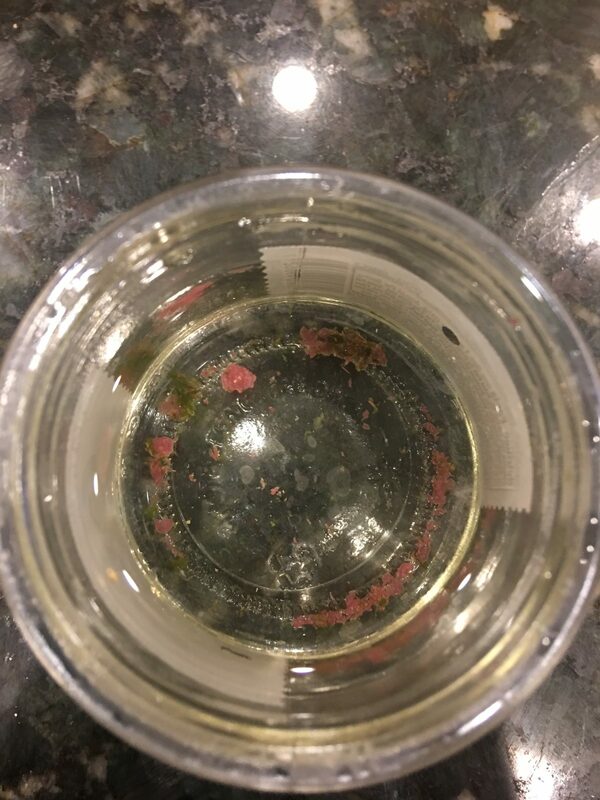 I’ve got tons of amphipods and copepods. Kinda fun to watch my PJ chase them on the rock. 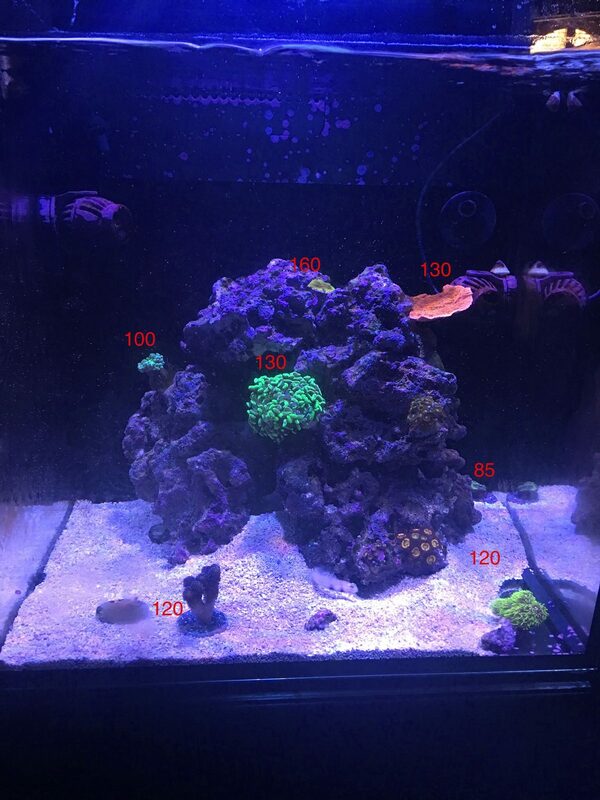 Once so e of these corals start to grow and shade them selves I’ll add the second AI prime to this tank to help with shadowing. These par numbers will help to dial them back to a reasonable PAR value. Hi! 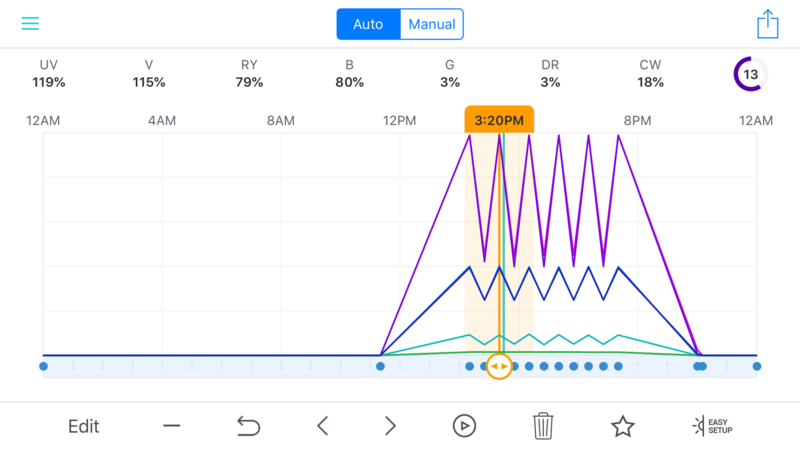 Running the same schedule (brs) but with a bit less drop in the "clouds" on the same aquarium. So thanks for chairing the par reading. Really nice set up by the way. Yeah, I set the drop in intensity up that way to try it out. I’m thinking about slowly reducing the drop over the next few weeks to increase the average PAR. 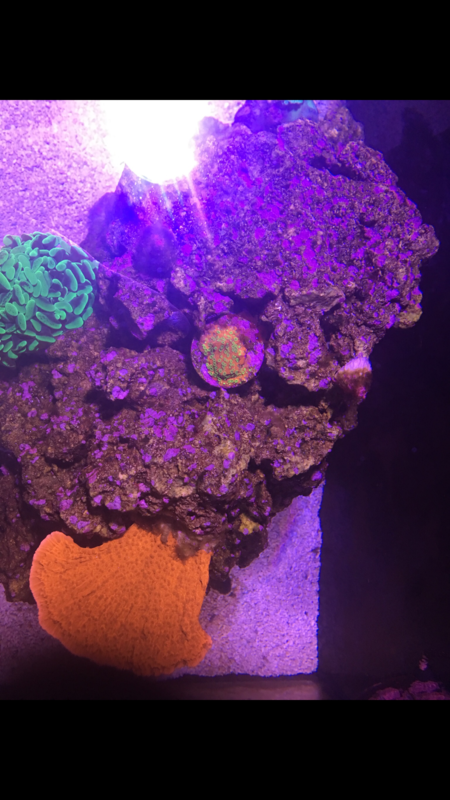 The corals look really happy and are starting to take off so I’ll watch how they respond. MY corraline is growing really fast these days.